Ms. Tharmaratnam is a Director at The Abraaj Group. She is responsible for advising The Abraaj Group’s partner companies on environment, social, and governance (ESG) performance. 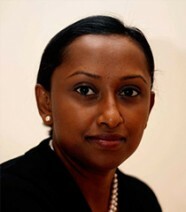 During her career in global growth markets private equity, Ms. Tharmaratnam has worked as both part of the Chief Investment Officer’s Office as well as the Global Portfolio Management team on sustainable private sector development, new fund development, and the implementation of environmental, social, and governance practices.